Geringer, L., & Joyce, W. (2011). Nicholas St. North and the battle of the Nightmare King. New York, NY: Atheneum Book for Young Readers. 2 – E. Aster Bunnymud and the Warrior Eggs at Earth’s Core! 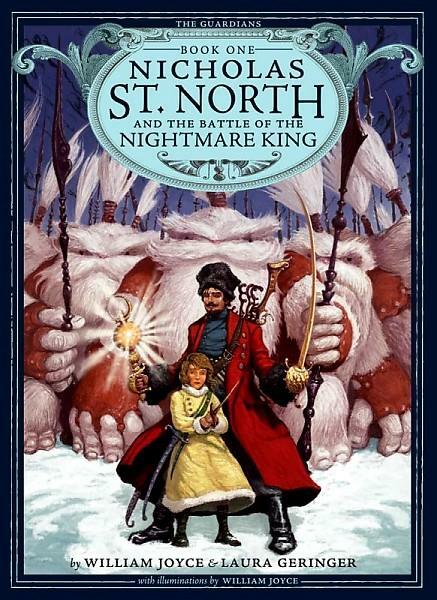 Nicholas St. North and the Battle of the Nightmare King is the first chapter book of William Joyce’s Guardians of Childhood. Though this book is intended for middle-age readers, it truly is a book to be enjoyed by all ages. It is an exploration of childhood mythology by combining folklore and traditions. The Guardians of Childhood books all take place on earth and before the characters become the famous myths we know them as today. This is creative blend of fantasy, science fiction… particularly steampunk…you’ll have to read to see how that fits in to the story, and fairytales. Meet Santa before he was Santa Claus. As a treasure hunting sword yielding Russian bandit, that with a change of heart becomes the apprentice of the last surviving Atlantian wizard, Ombric Shalazar. The two with the orphaned mysterious elfin girl Katherine, along with many exciting companions, such as the Lunar Lama Monks, armed Himalayan Yetis, a fighting Oak Tree, a domesticated bear, moon beams, and a spectral boy named Nightlight all ban together with the protector of dreams Tsar Lunar (aka Man in the Moon) to fight his evil arch nemesis, the nightmare lord Pitch and his fearlings that are determined to terrorize all the children of earth. If you want to try an entirely new series and enjoyed the highly engaging fast paced plot of The Spiderwick Chronicles by Holly Black and Toni DiTerilizi, as well as the descriptive language, frequent illustrations, and a fun, outlandish, and whimsical storyline, then you will enjoy the adventures found in Nicholas St. North and the Battle of the Nightmare King, and the other Guardians of Childhood books, E. Aster Bunnymud and the Warrior Eggs at Earth’s Core!,and Toothiana, Queen of the Tooth Fairy Armies, and the upcoming release (September 2013) of The Sandman and the War of Dreams. Also, don’t miss The Rise of the Guardians, a heartwarming major motion picture released in theaters November 21, 2012.